Udo - Crusty Prospector who knows where the Gold Is. Bill - Prospector, chronicler and sharer of the knowledge to you. I know a lot about the bush and gold prospecting in WA and that information can help you find gold in WA. I Live in the Goldfields and have lived there since 1991 - There is no way I would live in a city, I love the freedom of the bush too much. I've been prospecting and mining in WA for over 25 years. I have an active mining lease at Mindoolah in WA and work this lease all the time. I have prospected all over the state from the Kimberleys, through the Pilbara down through the Southern Goldfields and I have found some good virgin gold patches in my time prospecting. I've panned for gold, used dry blowing, been metal detecting since the 80's (1980's that is!) and used heavy machinery to recover gold. I currently tumble, cut and polish all my own gemstones and rocks for my own collections and also sell them locally. This knowledge and experience enables me to show you the best equipment to search for gold. I started with a White metal detector the white 5000 and later the White Vsat. Over the period I have used Garret Metal Detectors like the Ground Hog. I've also used the Minelab Metal detector range from the 1600 through the 2100, 3500, 4500 and the SDC2300 and my trusty Minelab 5000 metal detector. We also use the GPZ 7000 and teach you how to use it in our seminars. I've lost count of the different combinations of metal detector coils I have used, currently I use the Nuggetfinder Evolution series and the Coiltek Elite Coils- these with the Minelab 5000 are a pretty deadly combination. So what does this mean for you? - you can guarantee the information on our website is based on many years experience and knowledge and that means that the information on this website will help you find gold quicker and easier! Bill O'Connor, Prospector, at Amalgamated Prospectors and Leaseholders Association Open Day. My dream was to become a geologist but alas, because I married early and started a family the practicalities of earning money to feed a family overruled my desire to study at Uni. Back then (Yep - Last Century) studying part time while balancing work and family needs I came third in WA in the science subject Matriculation Geology. I retired in 2005 after 43 years with the same company - Australia Post in a pretty high position. 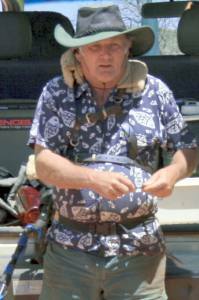 I then quickly took up my great love of geology and travelling around Australia after retirement. I started metal detecting for Gold throughout Western Australia. It didn't take me long before I realised that information about gold prospecting and metal detecting was bloody hard to come by, very secretive and required heaps of time and research. I spent a lot of time researching about how I could get simple, easy to understand and reliable information. - Locations where it was worthwhile to go detecting to find some gold. While I was prospecting and metal detecting around WA I met up with my old childhood pal Udo who took me to many places to detect for gold. I realized that his vast experience and knowledge is exactly what is needed to make metal detecting simple... if only you knew what he knew!!! and based on our knowledge and extensive research to help people to find gold in WA. - Where can I find gold in WA? - Where am I allowed to go prospecting in WA? - How do I get Access to ground to go Prospecting? - What is the best equipment for prospecting in WA? - How do I know EXACTLY where I am on the ground when prospecting? The answers to those questions is what we have developed based on our knowledge, experience and testing over the past 10 years. 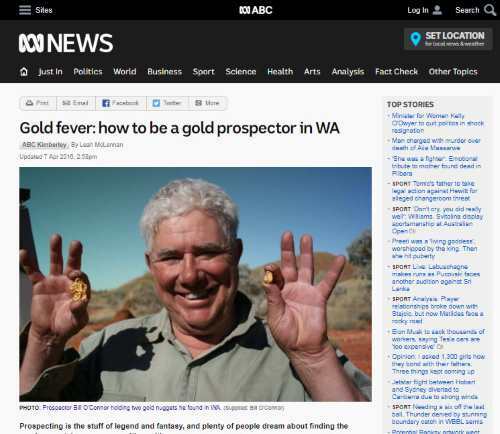 Udo and I developed this website gold-prospecting-wa.com, www.geomap-training-wa.com and are involved in www.goldtracker.wa.com. 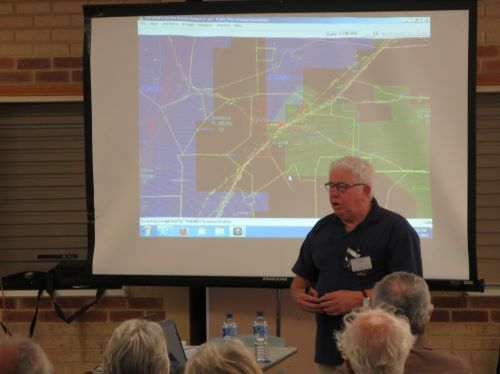 We have taught 750 people at 66 Seminars in Cue – 300 or more at other workshops at APLA Open Days, by invitation in towns like Geraldton and at other workshops. We have our own Mining Tenements in Cue and Sandstone. Udo and I both support the Gold Prospecting and Mining Industry in WA. We are both members of the Amalgamated Prospectors and Leaseholders Association (APLA) and have been for years. I am currently (2019) the webmaster of the APLA website and a Life Member of APLA. So if you have any suggestions or want something developed that will help you find gold nuggets in WA please contact us using our contact form.